6 All-Ireland Senior Hurling Medals – 1958, ’61, ’62 (Capt. ), ’64, ’65 (Capt. ), ‘71. 9 Munster Senior Hurling Medals - 1958, ’60, ’61, ’62 (Capt. ), ’64, 65 (Capt. ), ’67, ’68, ’71. 7 National League Medals – 1957, ’59, ’60, ’61, ’64, ’65 (Capt. ), ‘68 . 3 All-Ireland Minor Hurling Medals – 1955, ’56, ’57. 4 Munster Minor Hurling Medals – 1954, ’55. ’56, ‘57. 10 County Senior Medals - 1956, ’57, ’58, ’59, ’61, ’62, ’63, ’64 (Capt. ), ’65, ’74 (Capt.). 13 Mid Tipp Medals – 1956,-‘64, ’68-‘69, ’73, ’75. 4 County Minor Medals - 1954, ’55, ’56, ‘57. 7 Oireachtas Medals - 1960, ’61, ’63, ’64, ’65, ’68, ’70. Right-Full-Forward on the Team of the Century – 1984. Right-Full-Forward on Team of the Millenium – 2000. Right-Half-Forward on Tipperary Team of the Millenium – 1999. Texaco Hurler of the Year – 1965. Jimmy Doyle was genetically and environmentally conditioned to be a Tipperary hurler, as his uncle Tommy won 5 All-Ireland Senior Medals with the Premier county, and his father Gerry had been the substitute goalkeeper on Tipp’s successful 1937 team. Jimmy was reared literally a stone’s throw from Thurles Sportsfield which then as now was the “field of dreams” for all Munster hurlers. Jimmy’s talent was abundant and precocious. Though far from being big for his age, he was chosen on the Tipperary minor hurling team for the 1954 championship, with four years left at minor level. He was goalkeeper on that Tipp team which was beaten in that year’s All-Ireland Final by Dublin. Jimmy finished his minor career with 3 All-Ireland Medals under his belt, two achieved at the expense of Kilkenny and one against Galway, with the young Thurles man invariably being the star of the show. He also played a leading part in the success of Thurles CBS in the 1956 Harty Cup. By the time Jimmy reached his last year as a minor in 1957, he had already attracted the attention of the Tipperary senior selectors. He won his first National League medal against Kilkenny four months before he won his final minor medal, and was named on the senior team to play Cork in the 1957 Munster Championship semi-final requiring the minor selectors to keep him in reserve! A three point defeat was Tipp’s lot in that senior match and though Jimmy was largely eclipsed by Cork’s Paddy Dowling, but he had already let his mark on the day by turning around the minor game when introduced in the latter stages of contest that had been going away from Tipp. The following year Jimmy won his first All-Ireland senior medal and was leading scorer in the championship. He finished as the hurling championship top scorer on a record five occasions (1958, ’60, ’61, ’62, & ’64). The scores Jimmy accumulated in these years were : 1958 – 2-23, 1960 – 6-18, 1961 – 2-17, 1962 – 4-24, 1964 – 1-27. Examples of some of the scores he accumulated in individual games are ; 0-10 in the ’64 All-Ireland Final including 0-4 from play ; 0-9 in the ’61 All-Ireland final ; 1-10 in the ‘62 Munster Final ; 1-8 in the ’60 Munster Final ; 0-10 in the’64 Munster Final , and 1-8 in the ’58 All-Ireland semi-final v Kilkenny. He also scored 2-8 in the 1955 All-Ireland minor final against Galway. While inevitably “top scorers” are almost always also free-takers, it is worth bearing in mind that these scores were achieved in 60 minute games. He also was National League top scorer in 1964-65 (7-45), 1965-66 (4-20), and 1967-68 (3-50). Jimmy added a host of honours to his early achievements, which are all detailed above. He suffered quite a lot with injuries throughout his career and played a lot of the 1960 All-Ireland Final with head bandages, and played the following year’s final only with the aid of pain-killers. This accumulation of physical attrition on his slight frame probably contributed to the fact that for most part, Jimmy played a supporting rather than a central role with Tipp from 1969 on. Though he retired in 1970, he was back again to play in the 1971 Munster Final win over Limerick but injury ensured that it was as a substitute he contributed to Tipp’s All-Ireland victory. After this Jimmy retired again although he made a brief reappearance for Tipp in the 1973 Munster championship first round match against Waterford in Thurles, when he stood between the sticks due to the unavailability of Roscrea’s Tadhg Murphy who was to return for subsequent matches. Jimmy’s phenomenally successful club career ended in 1975, when he added his last County medal to the previous nine when Sarsfields defeated the Silvermines in the County Final by 3-6 to 1-10. This was Jimmy’s tenth County senior medal and his second time to captain the “Blues” to the title. He also had the honour of captaining Tipp to two All-Ireland victories in 1962, and ’65, though on the former occasion his team-mate Tony Wall had to accept the famous trophy on Jimmy’s behalf as he was unable to do so due to injury. 1965 was an extra special year in that Jimmy won All-Ireland, National League, Oireachtas, and County medals along with his brother Paddy who was part of the county set-up that year. 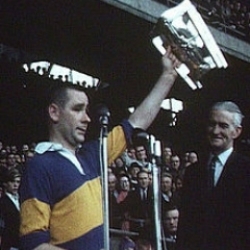 Jimmy Doyle is popularly regarded as perhaps the greatest forward to have donned the famous Blue and Gold ; and the self-effacing attitude and humility with which he accepts the praise and garlands which go with being one of the greatest hurlers of all-time epitomise this genuinely gracious and humble hurling legend. It is only fitting that this supreme hurling artist was an automatic choice on the Teams of the Century and Millenium. Note : Jimmy’s huge medal collection is on display at Lar Na Pairce – the GAA Museum in Thurles.